Every time I light this candle, everyone that comes into my bedroom tells me how nice my room smells. If you did not already know, you can find out how to get bath and body works in the UK here! 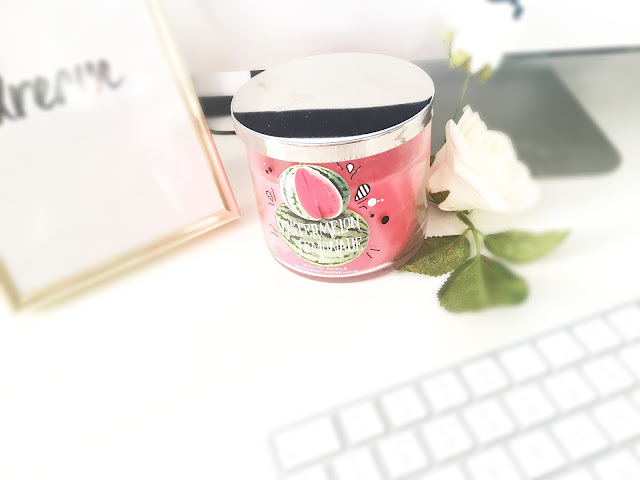 When I first smelled this candle it reminded me of the Jolly Rancher Watermelon sweets which I remember fondly when I was in America last year - if you don not already know I am obsessed with anything watermelon orientated. I find that this candle is extremely sweet but is very fresh smelling making the usual sickly sweet scent almost undetectable. The scent is very true to its name and reminds me of watermelons and lemonade combined however the watermelon scent is definitely more prominent than the lemon notes. This candle is very strong as it is made out of glass so it is extremely durable, the graphic printed is of a large watermelon with a smaller watermelon cracked open on top. The candle wax itself is a beautiful pink coral which looks so pretty sitting on my desk. The candle features 3-wicks which I find creates a stronger and more powerful scent. This candle weights 411grams and the burn time is 25-45 hours. Tip: Trim every wick 1/4 inch before each relighting, in doing this the flame will create ideal complete combustion where carbon particles are absorbed by the flame this means that less soot is formed while the candle is burning. Notino stocks lots of other bath and body works products such as more candles, fragrances, shower gels and creams and pocket bacs.